01:20:00 Makes 5 servings, 1 dipped apple (250 g) each. Makes 5 servings, 1 dipped apple (250 g) each. Crisp apples are dipped in melted caramel for a special autumn treat. 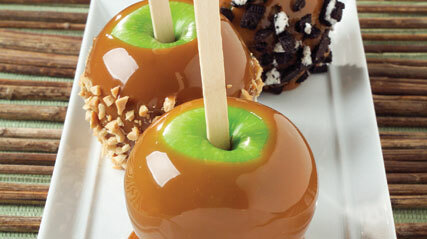 You can take these Ultimate Caramel Apples one step further with our special extra toppings. Insert wooden pop stick into stem end of each apple. Cover large plate with waxed paper; grease paper with butter. 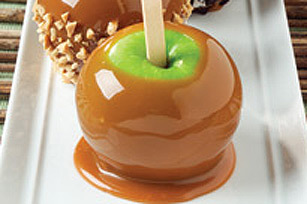 Dip apples in caramel; spoon additional caramel over apples if necessary to evenly coat apples. Let excess caramel drip off. Scrape bottoms of apples; place on prepared plate. Refrigerate 1 hour. Prepare as directed, rolling bottoms of freshly dipped apples in 8 finely chopped Oreo Cookies. Decrease water to 1 Tbsp. Microwave caramels and water in large microwaveable bowl on HIGH 2-1/2 to 3 min. or until caramels are completely melted, stirring after each minute. Continue as directed. Remove dipped apples from refrigerator 15 min. before serving; let stand at room temperature to soften slightly. Prepare as directed, rolling bottoms of freshly dipped apples in one of the following: 1-1/2 cups Jet-Puffed Miniature Marshmallows mixed with 1/4 cup sprinkles; or 1/2 cup chopped peanuts. Or, drizzle dipped apples with 2 melted squares Baker's Semi-Sweet Chocolate. Serving Size Makes 5 servings, 1 dipped apple (250 g) each.